Chicken with cashew nut masala recipe - Today I am sharing with you all a spicy version of chicken with creamy textured gravy of cashew nuts. 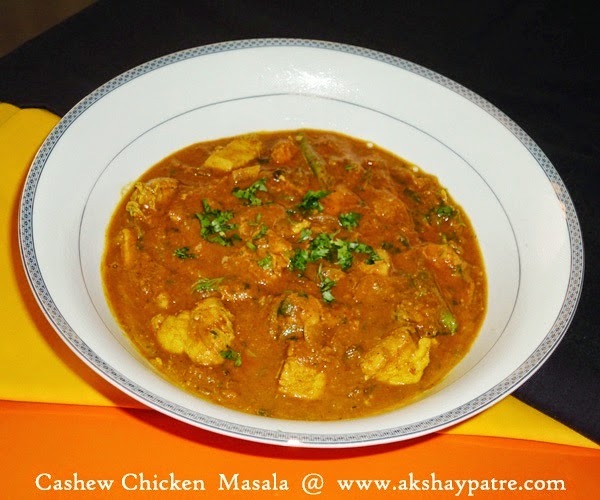 When it comes to non-veg dishes, I always find chicken dish very easy to prepare. Like every sunday, this sunday lunch also ends up in non-veg dish and that is cashew chicken masala. 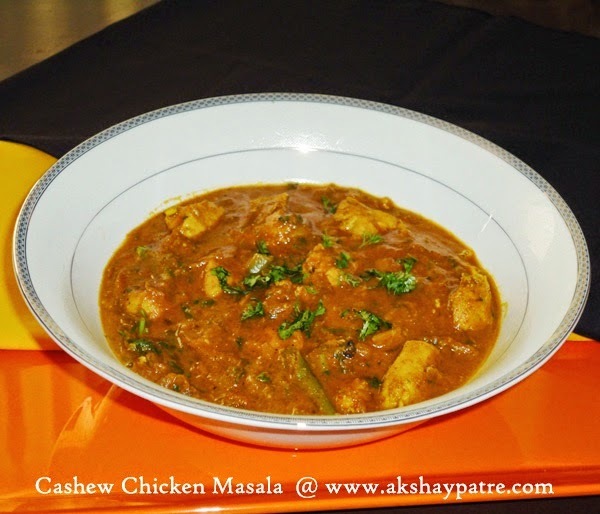 In this dish I have added cashew nut paste along with some other spice powder, onions and tomato puree to make it more flavorful and creamy, this wonderful combo combined well to give a fabulous taste. I have prepared this chicken masala for lunch and served with chapthi. We enjoyed it thoroughly. Mix the cashew nuts, cloves / lavang and cinnamon together and blend it to a smooth paste with little water. Transfer this paste to a bowl and set aside. Heat a tbsp of butter in a pan. Add the chicken and little salt. Saute for 2 minutes and cook covered for 5 minutes. Turn off the flame and set aside. Heat oil in a pan and fry grated onion till brown. Add pureed tomato and saute till oil oozes out. Add the green chillies, ginger-garlic paste, coriander powder, cumin powder, chilly powder, pepper powder, turmeric powder and saute for 3 - 4 minutes. Add the crushed brown cardamoms. Add the fried chicken and stir to combine. Add the cashew nut paste along with 1/2 glass of water. Add the salt and mix gently. Bring it to boil and then simmer on low flame till the gravy becomes thick. Garnish with chopped coriander and serve hot with choice of your flat breads and rice. We enjoyed it with chapathi.